“The traffic gets worse every year” is a common gripe we hear and often mutter to ourselves as we grind to yet another halt. 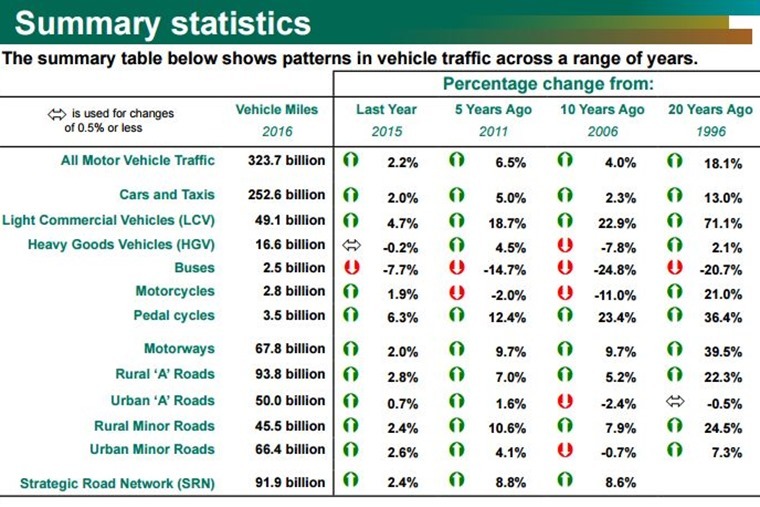 And for once, the facts back us up as the latest Road Traffic Estimates report from the Department for Transport (DfT) shows the rate of growth in vehicle numbers has slowed but continues to climb. Between 2002 and 2013, there was a fairly steady decline in car miles driven per person and per licensed car. In fact, while personal access to cars remained similar, people drove their cars fewer miles. Dividing car traffic by the number of cars suggests that annual mileage per car fell from around 9,500 miles to 8,300 over this period. However, from 2013 to 2015 car traffic grew more quickly than population and almost as quickly as car stocks, suggesting a slowing or reversal of the previous downward trends. In short, that means there are more cars, vans, trucks and buses on our roads than ever before. This is a double-edged sword as it demonstrates an economy in good health, regardless of what the doom-mongers will have us believe. It’s also proof the leasing world is thriving as a significant proportion of these vehicles are being funded in this way. Of course, the downside is the road network is not expanding to cope with the increased amount of traffic competing to use every square inch. There’s also the double whammy of public transport bursting at the seams to deal with its passengers, which has been further exacerbated by strike action on some of the busiest rail routes recently. No wonder then that car travel is up. 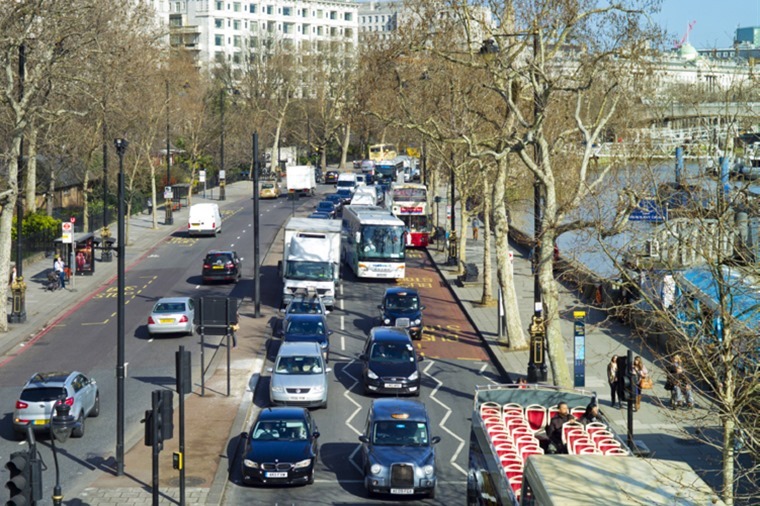 According to the DfT’s report, there were 2.3% more cars on the road in June 2016 when the study was carried out than in the same month a decade before. While that may sound like a very small increase, it’s worth bearing in mind the figures we’re talking about are large as there’s a total of 26 million cars in the UK, so even a small percentage rise equates to a big increase in the number on the road. It’s clear from the way the graphs are heading upwards that we won’t see any decline in traffic numbers or vehicle use in the near future. Again, that’s good for car manufacturers and leasing companies, as well as the tax man, but it does put pressure on drivers. 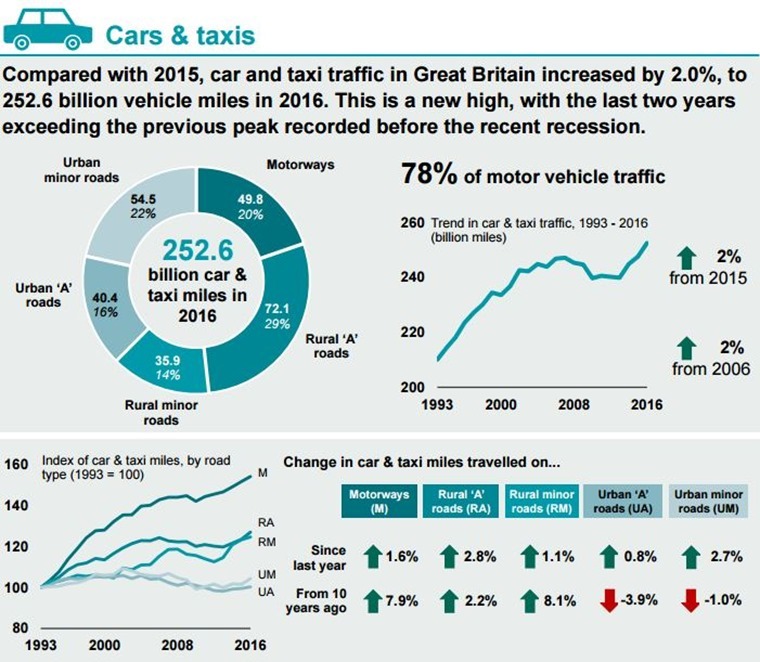 To prove the point, over the same 10-year period from 2006 to 2016, the number of miles travelled by car increased by 2.3%. So, we’re using our cars slightly more and racked up a total of 252.6 billion miles travelled in England, Scotland and Wales last year. That’s out of an overall total mileage travelled by all road transport of 323.7 billion. It’s clear, then, that car journeys make up the majority of miles in the UK. 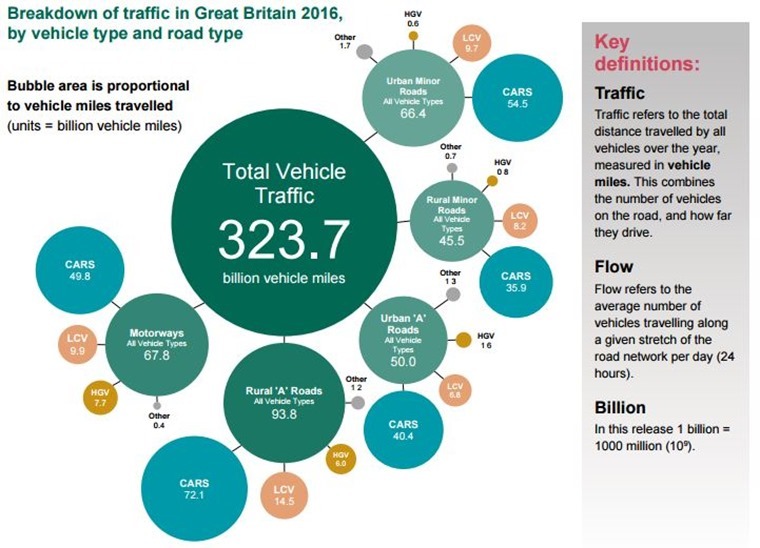 While this DfT report does not make any predictions about future vehicle use or the impact on our road network, it’s clear from the way the graphs are heading upwards that we won’t see any decline in traffic numbers or vehicle use in the near future. Carbon dioxide emissions fell by 6.3% from 2000 to 2014 despite a 7.6% rise in vehicle miles travelled. Some might point the finger and accuse drivers of laziness and an addiction to the internal combustion engine. However, the truth is far more subtle than that and most drivers simply don’t deserve to be branded in this way by the eco lobby. One fundamental factor in the rise is an expanding population. Let’s gently sidestep the whole Brexit issue here and just focus on the fact the UK’s population has been going up ever since the Second World War. Improved mortality rates among the young and old account for some of this, as does increased prosperity and access to healthcare. So, there are more people around and that means more of them want to use a car, which in turn puts more of them on the roads. The domino effect of social change is complex, but one of the obvious results is we have a greater number of cars and other vehicles driving today than ever before. Only around a fifth of all journeys are conducted on the motorway. That might sound like a recipe for yet more queues and jams, but there are some nuggets in the DfT’s report to brighten the motoring landscape. For starters, road deaths and serious injuries have consistently been reduced with each decade. From a peak in 1949 of 165 deaths per billion vehicle miles travelled, this is now down to 5.4 deaths per bvm. No one is going to say that’s fine as any death on our roads is unacceptable and we must always strive to make that number zero, yet it does show we’re moving in the right direction and should keep up that momentum. Another area where the statistics are improving is greenhouse gas emissions and air quality. Whatever you may have read recently in some sections of the press, the reality is cars are cleaner now than ever before. This isn’t to say they’re perfect, but road transport carbon dioxide emissions fell by 6.3% from 2000 to 2014 despite a 7.6% rise in vehicle miles travelled. And before anyone shouts that CO2 is no longer what we should be looking at, the emissions of nitrous oxide and particulate matter also both dropped in the same period. Again, this isn’t an opportunity to sit back on our motoring laurels, but it demonstrates that new cars are getting cleaner with every generation and the industry as a whole is actively working to clean up its act. Naturally, there’s more we can do to help and one pertinent fact to come out of the DfT’s report is that drivers now tend to use their cars more often but for shorter journeys. 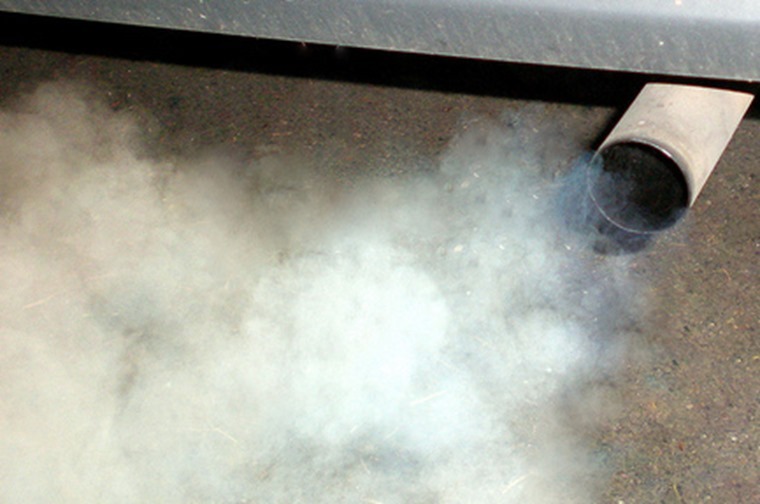 As we know, brief trips are the most polluting as the car is not up to ideal operating temperature for as long and many of these trips will be undertaken in the sort of stop-start traffic that is most damaging to the environment. This is backed up by the report showing that only around a fifth of all journeys are conducted on the motorway. We shouldn’t castigate drivers for using their cars on minor roads and in town, as they often don’t have a viable alternative. What we should be looking at is putting in place those other forms of transport to give people choice instead of beating up on car owners and other vehicle users. The Department for Transport report is an important yardstick to measure where we’re at and where we’ve come from in motoring terms. It draws no conclusions itself, but it does show we’re making informed choices that help improve the environment, even if we do spend a bit more time stuck in queues.